Malaysian's Food Taste: It takes more than grilling meat to make good satay. 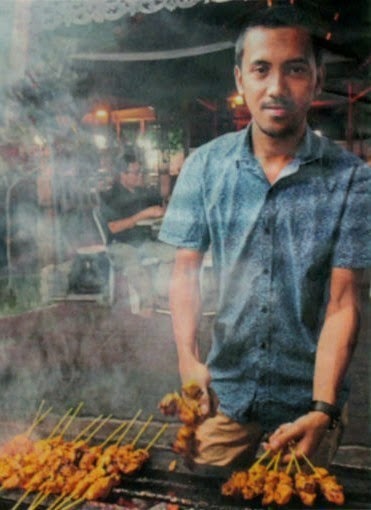 Satay Station director Muhammad Rahmat Zulkarnain believes that satay is only delicious if fat is present. The satay is prepared and chilled earlier in the day. Kassim keeps the cold chain going by cutting his meat in a cold room and storing­ it in chillers to retain the freshness. “We also don’t use frozen meat because it compromises the taste,” he said. 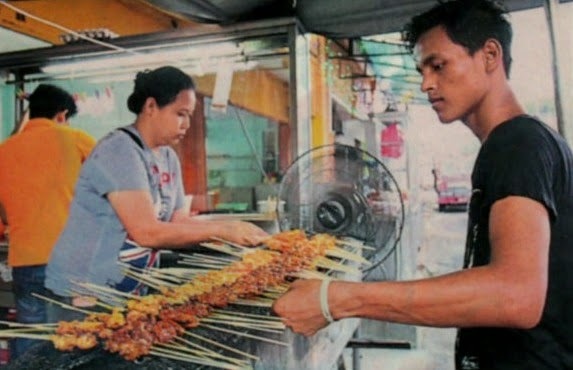 Another satay expert, Satay Station (in Kampong Pandan) director Muhammad Zulkamain, believes that satay is only delicious if fat -is present. “The fat adds flavour and sometimes it become crunchy in the grilling and that adds texture to the satay." Satay Station uses meat from the Whole chicken and a thick piece of skin and fat is sandwiched in the middle of the meat pieces - this goes for the beef satay as well. beef satay which he sells for RM1.60 a stick (chicken satay goes for RM1.40). Satay Station’s meats are cut in chunkier pieces and make for more substantial bites. Every satay master has to find his own secret recipe for a good marinade. “You do it by trial and error... you just keep adding and removing ingredients until you Íind the perfect marinade that people like," said Rahmat. But Rahmat did reveal that it’s not a case of the longer you marinate the meat the better the taste. According to him, the meat should be marinated for no longer than two hours, and this is crucial for maintaining the taste of the Chicken. l-le also added that it is important to ensure that the meat stays chilled at all times until it is ready for grilling. Skewers of meat grilling over an open lire is probably the most familiar image most of us have of satay. It is this open-flame grilling that gives satay its desirable characteristics: smokey with slightly bitter, charred bits to counter the sweet and spicy marinade. The small cuts 0f meat is best grilled for seven to eight minutes over charcoal fire, turning three to four times in the process, and at each turn, the meat gets a brushing of the marinade. “We add some honey and more sugar to the original marinade and use it to glaze the satay when grilling,” said Kassim. Of course, satay is only as good as its peanut sauce, but surprisingly, both Rahmat and Kassim said that there is nothing special in their recipe that cannot be found Online. Or they were being evasive. But if you are lazy to make peanut sauce from scratch, Kassim has a quick for you. “Add sambal paste and sugar to a tub of crunchy peanut butter and you will still get a good peanut sauce to dip your Satay in. Of course, that’s not how We do it, but you can always improvise,” said Kassìm. I think they are just giving me the runaround. But you get it - you need a secret recipe to make good satay and keep it distinct from the competition.